thing and worry about numbers. If you are looking for in depth analysis, we suggest you look at the link above or find another post about it. Nerf, better chance to shut him down early. Still seems really strong. Buff, not huge, still about same strength. ● Q overall does less damage at closer range, still does same damage at max range. Nerf, makes Nidalee harder to play, reduced dueling potential, late game poke will still be there. ● Q damage taken away early, more damage late. Overall just a shift in power, weaker early game stronger late game. ● Condemn changed. Should only affect the top level vayne players. Nerf, but will probably go unnoticed to everyone thats not at the top of the ladder for Vayne players. ● Passive no longer global, more movespeed for champions closer. Implementing some of the support changes riot has been talking about, passive and Q nerfed while W and E are buffed late game. Added scaling and reduced damage from most abilities. We will be releasing a Simplified Item Rundown tomorrow for Patch 3.14, look out for it! In most games of League of Legends you will get 5 or 6 of the players typing “gg”, or “Good Game”, as the nexus is about to explode. Some games you get the players who type out “bg”, or “gg easy noobs”. I will be one of the ones typing “gg” at the end of every game, win or lose, trolls or no trolls, and I will tell you why I think you should, too. I think of typing gg at the end of a game as the equivalent of the end of the game handshake in sporting events. That handshake separates the “game” from real life. To me it says what ever happened out there was part of the competition, and now that is behind us and I respect you as a person outside of the game. It has nothing to do with the game itself being good or not, rather, it is a way to ease all of the tension built up during the game. To me typing “bg” at the end of a game is like licking your hand before you shake hands with your opponent. It is an immature reaction, and it displays a person’s inability to handle defeat. One must understand that not everything in life will go their way. I don’t care if your jungler dc’d 3 minutes into the game, it is no one’s fault, and neither team has any control over it. Unfortunately, this leads to people saying things like “bg” or “bot lane fed” etc. In a very team centric game things like this are bound to occur rather often. If you can’t handle it maybe you should play a different game. Finally, let’s talk about the people who type “gg easy noobs” at the end of a game. These people make my head hurt, as it is the most cowardly way to insult somebody I could ever imagine. First off, you are hiding behind an internet name, anonymously playing with someone you will probably never play with again and certainly never play with in real life. Not only that, but you are doing it at the very last second you possibly can giving absolutely no chance for a response. This single statement leaves a bad taste in the opposing team’s mouth, and probably within that player’s own team. It is an unfortunate note to end any game on, and the emotions it causes in the other players may even spread to their next few games. All in all, gg is not saying “Oh that game was close,” or “I really enjoyed playing with you.” To me, it is just showing a little bit of respect to another human that shares the same interest as you. It is a way of putting the game behind you, and moving on with no animosity between players. If you can’t do this at the end of a game by typing two simple letters, then maybe you should reconsider what it truly means to play a video game. 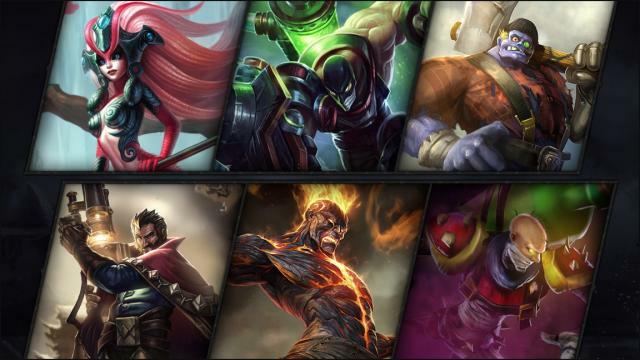 Champions – Plays all ADC’s. One of the best Ezreal players in North America. Plays a lot of Zed/Lee Sin/ Kha’zix in Solo Queue, as well as a huge variety of other champions. Our Scarra, who art in heaven, dognitas be thy name, thy donger come, thy dong be done, in LoL as it is in heaven, give us this day our daily bowflex, and forgive us of our #heimermechanics, as we forgive those who #heimermechanic against us, and lead us not into FrankerZ, but deliver us from Odee. Praise the Lord and everlasting Scarra, praise his son Qtpie, our savior, and praise the holy dong, it flows through us all and gives us life. For without the dong, man would not have conquered the bowflex, and the world would be lost to FrankerZ. We at The League Report have spent more time watching League of Legends stream than we care to admit. We want to put this time to good use and share some of our thoughts on the streams we watch so that our readers can find the stream that is right for them. Ranking: Our ranking of the quality of the stream from Bronze – Challenger. Note: This is not the streamer’s division ranking. YouTube Highlights: These videos will be small highlights from the respective stream to give viewers a taste of the streamer’s personality and streaming style before they tune in to the live stream. We hope you find our reviews helpful, and feel free to suggest streams in which you would like to see reviewed in the future! Graves (487 RP) – Graves is not in the best place right now as an ADC. He doesn’t benefit from the Tri-Force buffs like some ADC’s do, and he has received many nerfs in the past. Hopefully Season 4 will bring Graves back a bit. Brand (440 RP) – Brand is a very strong mid lane caster at the moment. If Brand manages to pick up a few kills in the early game he can 1 shot a lot of champions. He does massive AOE damage, so his team fights are scary. Great champion if you put the time in to learn him. Singed (292 RP) – Singed is one of the most annoying champions in the game to play against if he is played correctly. With his tankiness, his poison trails, and his speed, he is almost impossible to catch. Singed can split push all day, even while standing at the enemy’s Nexus killing two waves at once. Koi Nami (487 RP) – Koi Nami is a nice looking skin. It is playful and colorful, making the already fun to play Nami even nicer looking. If you are a Nami player I would recommend this skin. There has been talks of a new Nami skin coming out soonish, but nothing is confirmed. Augmented Singed (487 RP) – This is personally my favorite Singed skin. Singed has many skins to choose from, but this one has always stuck out to me. The green poison container and the cut off sleeve make this skin stand out, and I would recommend it. Lumberjack Sion (260 RP) – What’s not to love about a Sion skin? This champion is hilarious to play, and not many people know what he does. Come into the game as a Lumberjack and you will have your enemies shaking in their boots. (Warning: they may be shaking from laughter) I think that this is a hilarious skin, and will be buying it for this week’s sale. 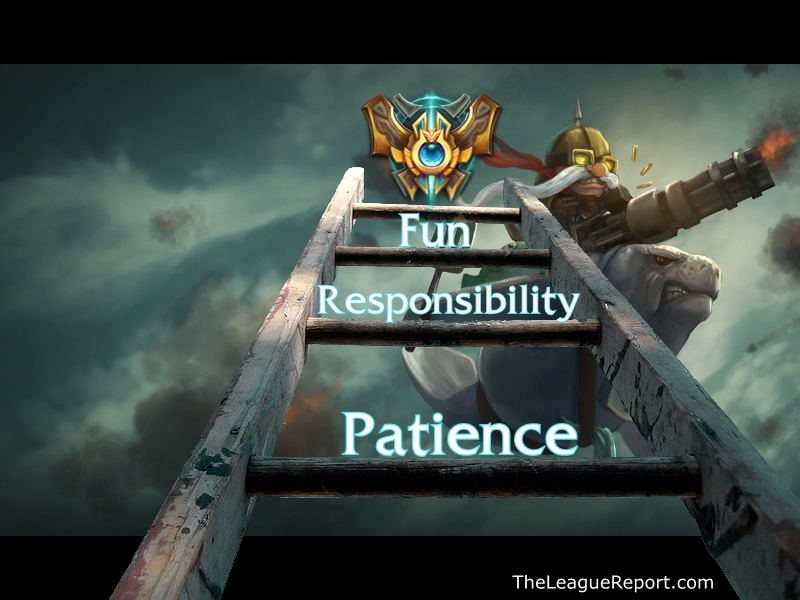 Players tend to think that they need to “carry” every game in order to move up the ladder of Ranked Play. This is not the case, no matter what these “Carry out of Elo Hell” streams say. The truth is that you can’t win all of your games. In fact, if the system is working properly you will win exactly 50 percent of your games. The first step in climbing the ladder is to ignore the trolls / feeders, and focus on yourself. The second, third, and fourth steps are to be patient, learn from your own mistakes, and have fun. Being able to positively impact your games will increase your entire team’s chance of winning to above the 50% standard. Assuming that the game matches you with people of even skill the best way to improve is to learn more from each game than your opponent does. If they truly are equally skilled before the game, you want to leave the game more skilled than them. For example, let’s say that you are a top main. The Team Builder system is in place, and everyone is playing their main role. If you are at your correct Elo, the enemy top laner will be of equal skill as you. This means that either of you can win the lane based on skill level. If you lose the lane, think about why you lost the lane. Did you all in at a bad time? Did you not know how long the cooldowns were on the enemy’s abilities? If you can leave a game recognizing your mistakes and learning from them, you will be a better player because of it. Sooner or later you will have gained more knowledge than all of the other top lane players in your Elo, and you will begin to win your matchups and help increase your teams’ likelihood of victory. Winning your lane is a way to help your team’s chances of winning the game, but looking at the good and bad things that occurred in your lane is a way to help your future teams’ chances of winning the game and raising your own Elo. Having fun is an important part of League of Legends and learning. If you play the game without having any fun, why do you play it at all? Having fun also puts you in a better mood, which will make it easier to think and recognize the good plays and the mistakes that take place throughout a game. It will also aid in the allocation of blame, as one who is in a good mood is much more likely to blame himself than someone who is in a bad mood. Seeing your own faults through this lens can improve your skills. So, how do you climb the elo ladder? Patience, responsibility, and fun. It’s not a race to get to the next division, it’s a goal. Don’t rush it; make sure that you learn from every game you play, whether it be a /ff at 20 for the enemy team, or a 60 minute heartbreaking loss. Take responsibility for your own mistakes, and learn from them. Finally, have fun while you do it. After all, video games were created for entertainment and fun, and let’s not forget that.